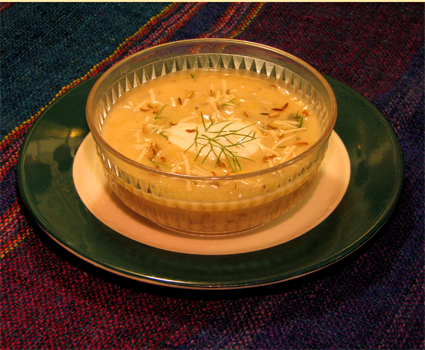 The white potato is native to the high altitudes of the Andes and has served as an important cultivated food since early civilization. The potato was introduced to the United States from Europe in the early 1700s. The potato is now the leading vegetable grown. 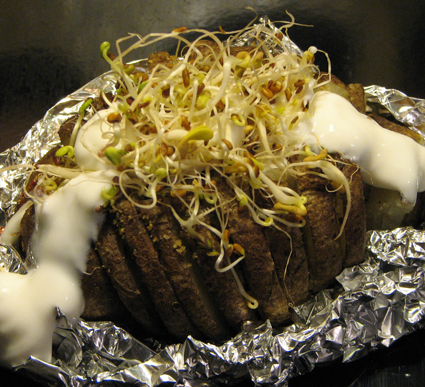 In addition to its high starch content, the potato serves as a source of a moderate level of protein and minerals. The biological value of the protein is high, however, and the potato therefore ranks among the leading crops in usable protein. If potatoes have green spots, they have been stored in the light too much. Some people say these green spots are poisonous, and others do not agree with this. They argue that a huge quantity of the substance is poisonous, but the little spots that occur on the potato do not amount to enough. It is a choice for you to make, but we usually cut them out to be safe. 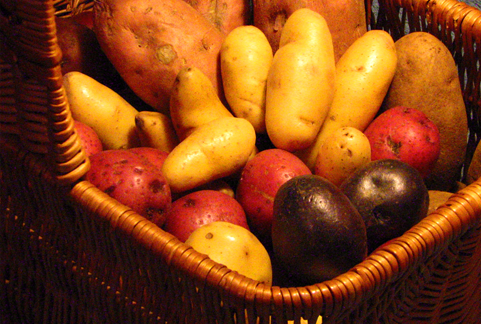 Potatoes are almost 10 percent usable protein. They supply important amounts of potassium, calcium, and phosphorus. They have more iron than milk and a fair amount of vitamin C. Potato starch is highly digestible, easily assimilated, and does not produce body fat. The butter, oil, sour cream, and mayonnaise we smother on potatoes does. Store potatoes in a brown bag to keep them out of the light. They will store at room temperature for a couple of weeks. Storage for a long time needs to be in an environment kept close to 40 degrees F and 90 percent humidity. Even if you live in a dorm, you can make a fast fantastic potato. In a conventional oven, it takes an hour to bake a spud. 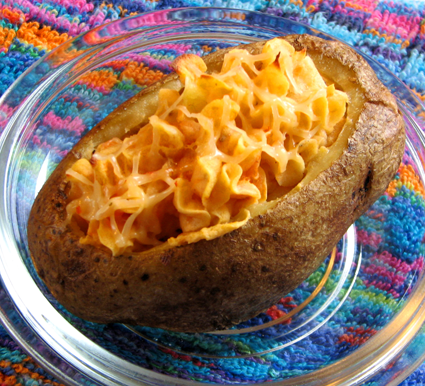 The microwave is quick but the flavor is not the same as a good old-fashioned baked potato. If you use the microwave and the toaster oven together, you have a winning combination. Preheat toaster oven to 400. With a brush, scrub the potatoes under running water. Pat dry. Cut the potatoes into wedges lengthwise. Place on a microwave safe plate. Cover with another plate. This will help hold in some of the steam. Cook the potatoes in the microwave on high for 10 minutes. Meanwhile, pour the olive oil into a flat wide bowl. Mix all of the spices thoroughly and spread out on baking sheet in a thin layer. 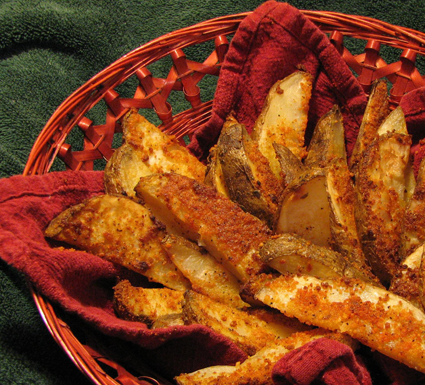 When the potatoes are done cooking, dip each wedge in the olive oil on one side, using tongs. Then dip that side in the spices and place on a clean baking sheet that has been sprayed with non stick cooking spray (the seasoned side up). Bake for 20 minutes. You can cook these in one batch in a conventional oven, but with the toaster oven it will have to be done in two batches. Why not just make half a batch if using the toaster oven? Because these are so good you will want to make a full batch. Served with salsa or sour cream, they make a very good appetizer. In flavor, nutrition, or economy, fast food french fries just don't measure up to these. Preheat toaster oven, or conventional oven to 400 degrees. Scrub the potatoes with a stiff brush under running water and cut a slit in the top of each. Place on an oven safe plate and microwave for 12 minutes on high. Allow the potatoes to cool enough to handle them. Peel the sweet potato. Scoop out the inside of the white potatoes, leaving a shell. Mash them together with the sweet potato. Combine the mixture with the salt, pepper, and milk. Spoon or pipe the mixture into the hollow shells and sprinkle with cheese. Bake 10 minutes or until golden brown on top. This can be made with all white potatoes but the flavor and color is not as good. If you want to make just one potato, use one large white potato and 1/2 of a sweet potato. Microwave about 5 minutes and then proceed as before. Microwave ovens vary greatly, and you will need to experiment to find the setting that works for you. If the potatoes are large with thick skins, they should be peeled. 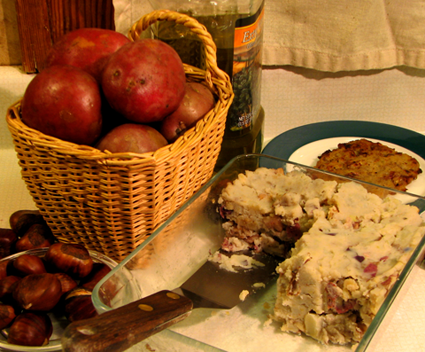 If using small young or red-skinned potatoes, they can be cooked with the skins on. The time it takes to cook the potatoes depends on the size of the potatoes. Large whole unpeeled potatoes can take 30 min. If cut into small pieces, they can be done in 15 minutes. Bring a large pot of salted water to a boil. If you are in a hurry, you can microwave the potatoes while the water is coming to a boil. (You can mash microwaved potatoes, but with a little boiling, they mash much better.) Carefully add the potatoes and cook until you can pierce them easily with a fork. Drain the water using a colander and return the potatoes to the warm pot. Using a masher or an electric mixer, smash them. Once they are as smooth as desired, stir in the milk or cream and adjust the seasonings to your taste. Instant potatoes are always very smooth, so many people prefer to leave their mashed potatoes a little bit lumpy, just so everyone knows that they are the real deal. 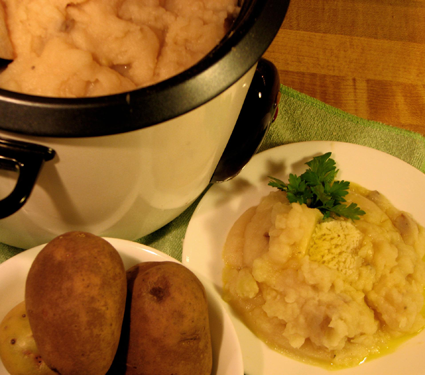 An electric rice cooker makes an excellent way to cook and serve mashed potatoes. Place two cups of salted water in a rice cooker and turn it to cook. Meanwhile cut the potatoes into pieces about the size of walnuts. Place on a microwave safe plate. Microwave the potatoes on high until the water in the rice cooker comes to a full boil. Place the hot potatoes carefully into the water. Cover and cook for about 5 to 10 minutes until tender. Drain the potatoes in a colander. The rice cooker will then automatically turn to the warm setting. Complete the potatoes the same way as above. Place the pot of potatoes back into the cooker. They will stay warm until you are ready to eat. If you have left over mashed potatoes, they make a great addition to breakfast. Pack the hot potatoes into a loaf pan. To make the patties, cut off thin slices from the cold loaf. You can fry them in a pan, but it is much easier to brush them with butter, or olive oil and bake at 425 for 10 to 15 minutes. You can see a potato patty in the background of the next picture. Adding these two ingredients turns plain mashed potatoes into something fabulous. In fall, you can usually find chestnuts in the supermarkets right next to the bulk nuts. To prepare them, first cut a slit through the outer shell on the rounded side. A utility knife with a clean new blade works best. Set the blade so that it extends 1/16 of an inch. This cut will split open when roasted and make the shell easy to remove. Arrange the nuts in a single layer on a baking pan, cut side down. Cut off the top of the individual cloves but leave the large garlic bulb intact. Rub the outside with olive oil, wrap in a piece of aluminum foil. Bake the chestnuts and garlic at 425 degrees. A dark or black baking sheet does not work well because it will burn the nuts and garlic as it transfers the heat too quickly. The garlic is done when it is soft and buttery, but not burned. It will take about 20 to 30 minutes. It is best to check as the chestnuts are cooking to make sure the creamy white nuts inside the shells are not burning. Another easy way to cook this is in the microwave/toaster oven technique. Prepare the garlic and chestnuts in the same manner, except wait with the foil. Preheat the toaster oven to 400. Wrap the garlic in a paper towel and place in the center of a microwave safe plate. The nuts go in a circle around the rim of the plate. Microwave on high for 2 minutes. After microwaving, wrap the garlic in aluminum foil. Place the garlic and chestnuts on a pan and roast in the toaster oven for 12 to 15 minutes. When the nuts are done the outer shell and inner membrane should peel off easily. Chop them roughly. Chestnuts are not crunchy like walnuts. Soft and sweet, they blend well with any mashed vegetable. Squeeze the bulb of garlic to make the individual cloves pop out. Mash them and mix with the chopped nuts. Stir this mixture into the warm potatoes. You can leave out the garlic, but remember once roasted it is very sweet and delicious. Give it a try. Preheat oven to 375 degrees. If you do not already have cooked potatoes, cut them into 3/4 inch cubes and place on a microwave safe plate. Cover with another plate and cook on high power for 10 minutes. Meanwhile, in a large heavy oven-safe fry pan, over medium heat, toast the quinoa until light golden brown. Stir occasionally. Remove the grain from the pan as soon as it is done. It can burn quickly. Increase the heat to medium high, add 2 Tbsp olive oil and the onions. Cook for 2 minutes until the onions are translucent. Add the garlic and cook 1 minute. Salt and pepper the onions and garlic, add the grain and the water. Cover, reduce the heat to medium low and let the mixture cook for three minutes. Add the cooked potatoes and parsley. Salt and pepper the potatoes and gently mix. Cover everything with cheese and place the pan in the oven to melt the cheese and heat the potatoes. It will take about 15 minutes. Top each individual serving with a little extra cheese and parsley. You can use any mixture of cheese, but a blend of mozzarella, cheddar and Parmesan makes a great combination. If you want to make it ahead of time, assemble it, cover with plastic wrap when cool and refrigerate until you are ready to heat. With cold potatoes, it will take at least 30 minutes to heat through. 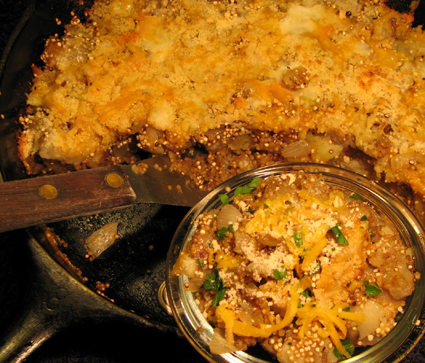 Quinoa is an ancient grain, a primary staple of the Inca civilization of South America. It is considered to be the most nutritious of all grains: containing all eight essential amino acids and a good source of iron. 1/4 cup supplies 6g of protein and 15 percent daily value of iron. In a soup pot or dutch oven, fry the bacon until crisp. Remove the strips from the pan and reserve for later. If not using bacon, add 1 Tbsp of olive oil with the onions and cook until the onions are limp but not browned. Add salt, potatoes, carrots, and water. Bring the liquid to a boil. Cover and simmer for 15 minutes. Add the spinach and cook until tender and dark green, about 3 minutes. Add the milk, heat but do not bring to a boil. Serve topped with crumbled bacon and a Tbsp of salsa. If you can find it, black bean and roasted corn salsa is preferred. Sprinkle lightly with smoked paprika. In a large soup pot or dutch oven, saute the onion in the olive oil until translucent and tender. Add potatoes, leeks, fennel, herbs, seasonings, and water. Bring to a boil and then reduce the heat to a simmer. Cover and cook for an about 90 minutes until all of the vegetables are soft. Either mash with an hand blender, or remove most of the vegetables with a slotted spoon and process in a blender until smooth. Just before serving, add the cream or milk. This can also be made in a slow cooker. Cook 4 hours on high or 8 hours on low. 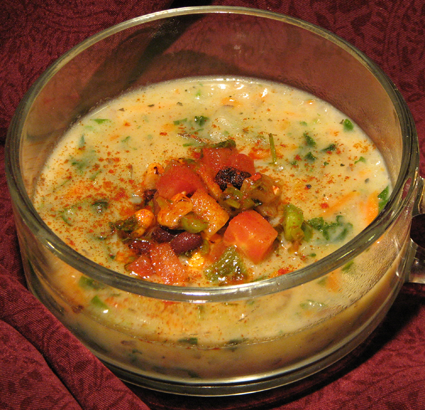 To serve, top with a dollop of sour cream or yogurt. Sprinkle with lots of fennel fronds and a few toasted fennel seeds. *To toast fennel seeds, heat them in a dry fry pan over medium heat for a minute. Use sparingly, they have a strong slightly bitter taste.